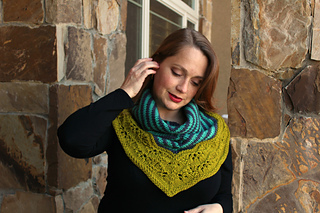 To purchase this pattern with the DK-weight Blye Shawl, choose the ebook option at right! This generously-sized cowl has a lot of versatility — wear it as a topper over a long-sleeved shirt in transitional months or tuck it under a coat for extra coziness during winter. 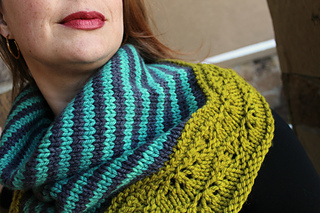 Knit in The Plucky Knitter’s Plucky Bulky, the combination of stripes and lace provides a background for color palettes both subdued and eye-catching. 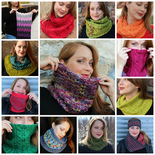 Instructions are also included for a Bonus Cowl (6th & 7th pictures) that can be made from the remainder of your three colorful skeins. This pattern contains both fully charted and written instructions. 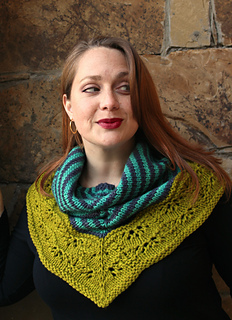 The cowl is initially worked flat, in the manner of a triangular shawl, for most of the striped portion. The work is then joined in the round for the remainder of the stripes and the lace border. The Plucky Knitter Plucky Bulky — 100% superwash Merino — 135 yds (123 m) per approximately 107 g. If knit to gauge, three skeins of Plucky Bulky should make both cowls. Shown in colorways Tin Type (Color A), Baubles (Color B), and Ogre (Color C). Plucky SNUG is another great yarn alternative, however, be advised that based on gauge, you might run close on yarn in the lace border. 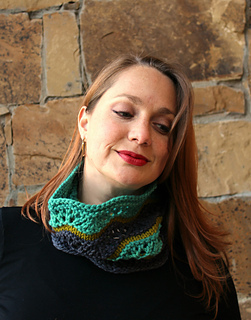 Bandana Cowl — 20” (51 cm) depth, 48” (122 cm) around base, 23” (58.5 cm) neck opening. Bonus Cowl — 24” (61 cm) around, 8.5” (21.5 cm) high. 13.5 sts and 19 rows to 4” (10 cm) in stockinette st, blocked. 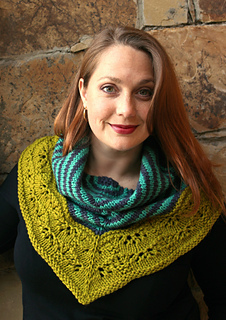 PLEASE NOTE: Changes in gauge will affect finished size, look of motifs, and amount of yarn used. To meet these dimensions, be sure to use needle size that gives gauge. 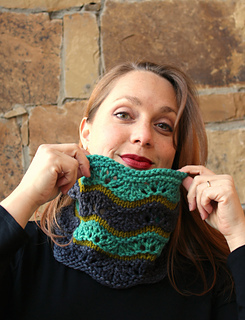 Bandana Cowl — US 10 (6 mm) circular, 32” length, plus US 10.5 (6.5 mm) needle for bind off. 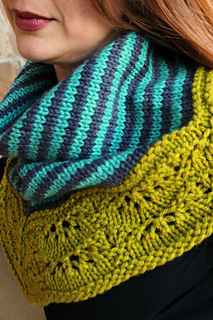 Bonus Cowl — US 10 (6 mm) circular, 24” length (bonus cowl). 12 stitch markers (2 of them distinct to mark beginning of round and center spine in lace section), tapestry needle. Many thanks to The Plucky Knitter for their support! This pattern was tech edited by Lisa Beth Houchins (Meanest Mommy Knits) and has also been test knit.